Some news- the female voice in the sith Holocron has been listed as Nika Futterman...who was the voice of Asajj Ventress in the Clone Wars....so could Ventress have left this holocron or will we be seeing a new female sith lord like Darth Traya brought into canon? Ashoka is quite great, actually...she's not dead, right? I know who you're talking about, but don't let that "girl" ruin your impression of one of the coolest Jedis we've seen in the saga. Her fate is left ambiguous, but it looks like she is seen walking into the temple at the end of the video. Notice the white, green, and gold. It is possible that either the convor is the spirit of Daughter, watching over Ahsoka, or that it represents Daughter, whose life force is connected to Ahsoka. Dave Filoni said: "In some ways, I could say that it's a messenger, it's an observer. It is definitely something. And I would suggest – I would rather have fans debate – but I would suggest to say that whatever that thing is an avatar of has actually appeared in the animated Star Wars universe before. So decrypt from there... Have a fun summer!" Seems like the convor has some significance. If Ahsoka is actually still alive, there could be a lot more left to her story. can you provide links where I can watch this for free? Looks and sounds great. I'd like to participate in the discussion but have no clue where to find this. I've heard I can watch episodes on Youtube but couldn't find this. The Clone Wars is on netflix. Otherwise, the 3 Mortis episodes are on youtube, although the pitch is slightly higher as a way to get around automatic copyright protection. The 3 episodes are: Overlords, Altar of Mortis, and Ghosts of Mortis. Rebels can be seen on Disney XD's youtube account, from what I hear, or on On-demand through cable. That video I'm so excited for the Ahsoka book. Topics "Convor Birds - The Clone Wars and Star Wars Rebels Connection" and "Ahsoka and Daughter: consequences from the Mortis Trilogy" have been merged. 1.The Lego Force Awakens Short titled 'Rey Strikes Back' features the Ghost Ship flying off from Jakku and Choppers voice can be heard as well.....so this is not canon but could it be a clue that Chopper is alive and on the ship? But what about the rest of the crew? Many would be in the same age group as Obi-wan was in ANH....only Ezra would be in his early 50s as would Sabine.....could they still be on the ship or is it a new crew? Could any of them make a brief appearance in Rogue One or episode 8? 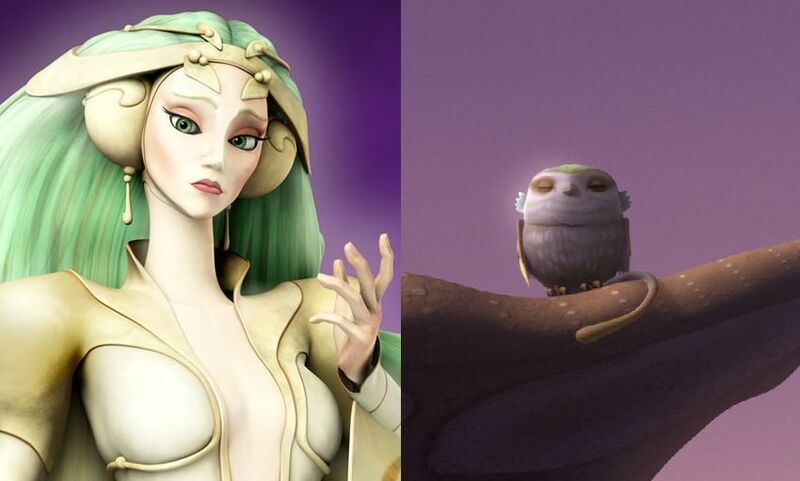 [Star Wars Rebels] Will we see Alora and Pipey again? I was re-watching old episodes of Star Wars Rebels and in the episode- "The Future of the Force", the ghost crew rescue two force sensitive infants from the inquisitors and reunite them with their families. The first is a human baby named Alora who was reunited with her grandmother, and the second was an Ithorian boy named Pipey who was returned to his mother. Ezra is 16 at this time (Luke and Leia's age). Alora and Pipey would be around 8 years old when Ben Solo was born. Could they have been part of Luke's new order? Will they be KOR? Will we get to see the grown up version of these characters in the ST? I hope we do because there should be more force sensitives around if the jedi order has to be restored by the end of the ST.
We already have precedent of a novel/comic book character becoming a character in the ST (Temmin Wexley appers as a young boy in Aftermath and as an adult pilot in both TFA movie and the Poe Dameron Comics). On the Star Wars Show, we saw a few minutes from season 3 of Rebels.... Ezra, Sabine and Zeb are rescuing the pirate Hondo Ohnaka and a little pig like guy from an imperial prison... we hear Hera's voice as well but Kanan is absent. 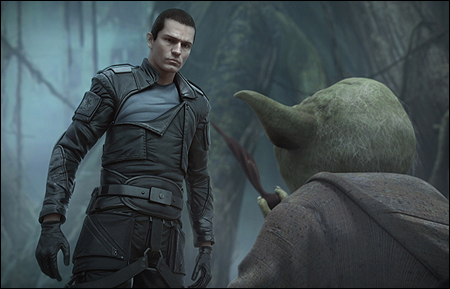 Most notable is Ezra- he looks older, sports a new hairstyle (a little similar to Galen Marek of the EU) and his new green lightsaber. Prediction time: Based on Ezra's lightsaber colour and hilt design, his use of extremely acrobatic Ataru style fighting (this especially!!!!) and his obvious influence of using the light and dark side- I predict that we're seeing Quinlan Vos this season in Rebels!!!! I think he is guiding Ezra!!! Oh gosh I'm so excited about everything. I caught up on Rebels a couple weeks ago, just in time. I'm loving Ezra's new look so much. Your prediction about Quinlan Vos makes a lot of sense! They are always having characters from The Clone Wars cross over, so I can see it happening. I'm only in the beginning of The Clone Wars season 2, so I haven't seen Quinlan yet. And I haven't read Dark Disciple either. I really should though, he sounds awesome. He doesn't appear in Season 2 of Rebels but his arc was never closed in the Clone Wars cartoon and it was left open ended even in Dark Disciple.... and he has a duel pending with Maul based on unfinished clone wars concept art.... going slightly into spoiler territory- Maul has appeared in the finale of season 2.... so there is a good chance Vos will appear in season 3... he is the best person to teach Ezra to balance the light and the dark. @panki Duuude! That bit about him having a duel pending with Maul is really selling me on your prediction. And helping Ezra with the balance of the light and the dark. But what about Kanan in this? hmmm. His absence from the clip worries me. This is kind of spoiler-ish too. I don't think Asohka will appear in Rebels anymore, probably? (hopefully we'll find out during her panel, what they are going to do with her character but since Dave Filoni said this:What happened to Ahsoka Tano? So there would certainly be room for another jedi, probably. And what are they going to do for the villain force-sensitives? They can't do more inquisitors, can they? Those last two inquisitors weren't all that fun. There is Maul, but I doubt he'd be working for the empire. And would Vader show up again? idk how else they would amp up the intensity/challenge? @jakkusun wrote: @panki Duuude! That bit about him having a duel pending with Maul is really selling me on your prediction. And helping Ezra with the balance of the light and the dark. But what about Kanan in this? hmmm. His absence from the clip worries me. I have a feeling we'll only learn what happened to Ahsoka after the release of the novel in October.... there is a chance she might briefly appear in Rebels but it makes more sense to continue her story in a novel or comic series. 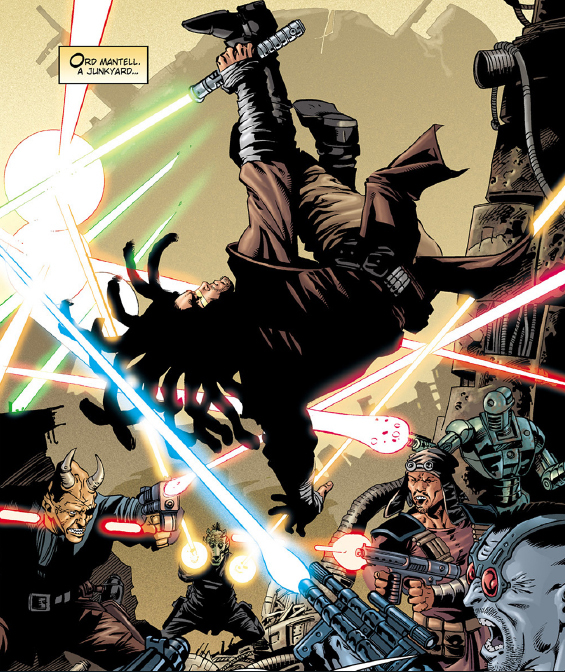 Kanan has a force vision in the jedi temple at Lothal where the Chief Inquisitor fights him, and he picks up a red lightsaber in addition to his existing blue one...it makes me wonder whether his blindness might make Kanan turn to the dark side... or worse, give up being a rebel altogether. I also read that we wont be seeing much of the Inquisitors in season 3 because the timeline of this season is shortly before Rogue One and ANH...and ANH didn't show Inquisitors... but am sure we'll see Vader...he'll probably land up at strategic moments and kill a few people. I know the concept art showed Vos fighting Maul.. but I think a fight between Vader and Maul is also long overdue.... The one thing I am very interested in is Sabine's firebird symbol....it looks like the symbol the resistance adopts later... that is not a good sign for the future of Ezra and Sabine if we look at the fate of Galen Marek.... even Ezra's hairstyle is the same as his now. @FrolickingFizzgig wrote: EZRA'S HAIR. NOOOOOOOO. Ooh! I do think Kanan abandoning the rebellion rather than turning to the dark side is more likely, though. He already showed some signs of not really liking being a part of the rebellion once they joined with everyone else. Oh so the resistance symbol symbol was the Merek family crest? So if the origins of the resistance symbol have anything to do with Sabine, her story could borrow bits of his story. And Sabine is going to be more important this season, for sure. Oh my gosh haha. The hair is the same. Shoot. I agree with you.... Kanan will probably leave the rebellion...at least for some time.....maybe returning at the end of season 3 to do something heroic. I think that they've changed the story of the symbol in canon...instead of linking it to a Marek type character, they're probably bringing in the Mandalorian death watch into the picture... isn't she supposed to become leader of the death watch? I'm interested in how that plays out considering she is a rebel as well. @panki Oooh Yeah her mother was Death Watch! (didn't even notice that when I watched the episode cause I haven't seen the mandalorian clone wars episodes yet) According to my research, Death Watch was pretty tiny by the time of the OT? idk if she could be the leader of it? It depends on if it is still around? idk Sabine told the other Mandalorians that she wasn't Death Watch, just her mother, but you are right this is probably gonna be a huge part of her story, since they teased it as part of her family/past. And Maul has a history with Death Watch, too, lol. I need to catch up on Rogue information! I will always be amazed at your ability to be knowledgeable on all Star Wars subjects, and then connect them all. I'm looking forward to your spoiler/connections/theories/predictions. I KNOWWWW!!! AHHHH!!! Imagine if Kylo cut his hair like that!